Yes, that’s WWE star Triple H. Yes, that’s Danganronpa character Aoi Asahina. Yes, they’re starring together in an absurd hour-long crime drama where the two worlds collide. 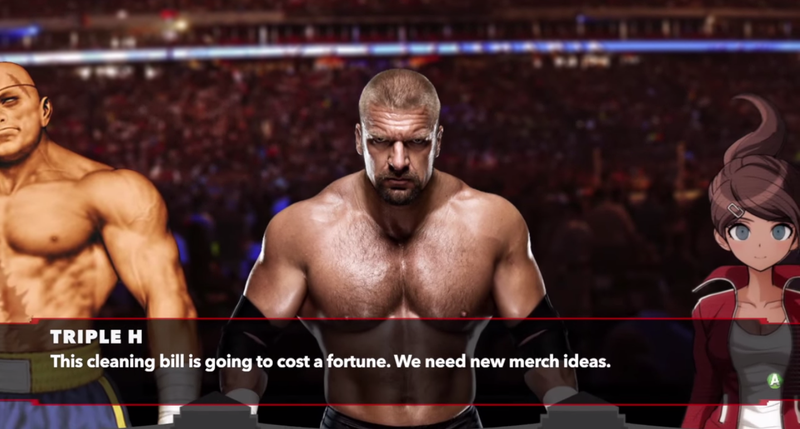 This isn’t the first time YouTube creator Alfredo Dizon has mashed up WWE and Danganronpa, but he’s taken it to new heights with this latest video. How come? Well, for one, it’s completely voice acted. It’s not the same people from the games, but it works. Previous installments in the series had used WWE 2K14’s story creation mode (and there are elements of that featured here), but the vast majority is a careful recreation of the trial section from the Danganronpa games. “I kind of went overboard in production values for a goofy joke,” Dizon told me in an email. And we thank you for it, Dizon. He was even forced to rip high-res sprites from the game using a PlayStation TV. “Then, there was putting it all together and animating the whole thing on my ancient computer,” he said. Make no mistake, this is really dumb, but it’s the kind of dumb that I can really get behind.